It’s quite easy to miss New Life as the three-storey, lime green building is hidden from the busy street by a row of trees. While it lacks character, rooms are clean and reasonably sized and represent great value for money. 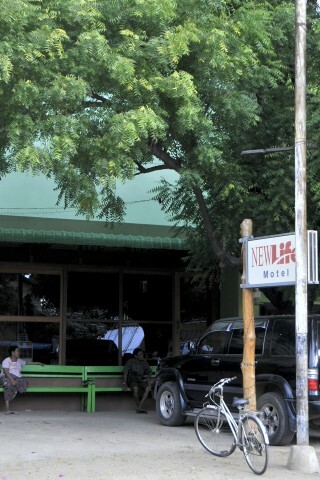 New Life’s business card has an address of Main Road, though the location is quite clearly Anawrahta; one sign announces a guesthouse, and another a motel. You can’t park a car here so we’ll forget motel, and the location is at the market end of Anawrahta Street, next door to Thante Hotel. Staff are friendly but have limited English; you do get the feeling they’re used to dealing with local visitors -- or perhaps drivers and out of town guides -- as much as foreign ones. Rooms we saw were very slightly musty but overall, while lacking any decor apart from the varnished wood panelling on the walls, they were clean and spacious enough. What’s more with air-con, TV, ensuite cold-water bathroom and breakfast for $20, in low or high season you’ll have a job finding better value for money in Bagan. Being tucked away, not very well known and with a fair number of rooms you’ll also have a better chance of finding an available room here in peak periods than you will in most places. All rooms are evenly priced, with just a $5 supplement for two-person occupancy and they said prices do not rice for the high season. A good deal! Room: Standard double room, low season: US$25, high season US$25. Notes: Single: $20.